When candidates were officially announced in April, Melbourne Heritage Action sent the following questionnaire to all candidates, and published below are the responses. At the time of writing this blog on the 2nd of May, the following candidates , 8 out of 13 running, had responded. All answers are presented here unadulterated, barr Sally Capp’s response which came in the form of a letter addressing a few of the points rather than as a response to our specific questions. Rohan Leppert and Sally Warhaft also responded with seperate letters of reply, which are attached at the bottom alongside Capp’s. Voting closes Friday 11 May 2018 at 6pm for all City of Melbourne residents. MHA is a lobby group dedicated to the protection and promotion of heritage in the CBD and fringes, an area undergoing intense redevelopment pressures, with subsequent loss of heritage places. We have a large following on social media, showing that many Melbournians are intensely interested in the fate of the heritage places of the CBD and fringes. We hope you will answer these questions as best you can, and we will publish them on our website, and promote through our social media. We believe that the historic buildings, precincts and laneways of Melbourne’s CBD and the surrounding former industrial areas are a vital element of Melbourne’s character, essence, liveability and desirability. Do you agree ? I 100% agree. I believe these buildings and laneways are part of the attraction of the city and people travel to come visit them. It is a shame there is not more money spent in upkeeping them. I agree. I am passionate about maintaining Melbourne’s heritage and dismayed about what has been lost. I keep with admiration a number of 19th century Melbourne sketches of Victorian building that have been destroyed. This would not have occurred in Europe. Had these heritage buildings survived they would have made a fantastic tourist attraction. Appropriate development need not destroy or violate character, culture or heritage. In Paris for example, new development is kept remote from historic buildings. We should not be made to feel like ill-informed for wanting to preserve our heritage and identity. I am not in favour of the redevelopment plan for the QV market. Melbourne’s character is unique: with its bluestone pavements, gold-boom- era architecture, and world class buildings like the UNSECO World Heritage-Listed Royal Exhibition Building in Carlton, the Melbourne Town Hall, Victorian Parliament House, the Shrine of Remembrance, Manchester Unity Building on Collins Street as well as more modern treasures like the ICI Building on Nicholson Street and Nonda Katsalidis’ Republic Apartments. Laneways have also become an essential and iconic part of the city’s cultural heritage and they are to be respected and celebrated. I agree. The current review of the Melbourne planning scheme’s heritage policy has been a complicated process, but I have sought to improve the provisions around protection of all heritage fabric in this policy, which is now before a planning panel for scrutiny. Heritage conservation is essential to keeping our city interesting and liveable, and is the most visual and impactful means of creating a sense of place and telling our city’s remarkable history. Yes. Melbourne’s heritage is what makes it so culturally unique and we need to protect these areas from being destroyed by developers. We need to be thinking about heritage as a social aspect of the city and we need not only protect buildings but also make sure that heritage spaces remain public spaces that can continue to foster and serve the community. 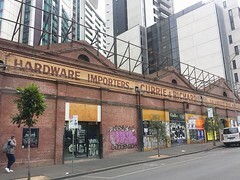 The City of Melbourne has recently completed heritage studies for new precincts in Guildford lane, Hardware Lane and Southbank, and has started a full review of the CBD. Do you support these studies, and are you likely to approve their recommendations? YES I do. Strongly supported the Little Lonsdale Heritage report several years ago. That study should probably have extended to Bennetts Lane. I am in favour of the heritage areas outlined but they should not be exhaustive for other areas and precincts. As a social scientist I will be having a close look at the studies involved and regulations to make sure the intent of heritage is achieved. we can protect them, though I will wait until recommendations are made before I make any specific commitments but, as a general principle, I support better protecting the heritage fabric of this city. I commissioned the Guildford and Hardware lane review, the Southbank review and the Hoddle Grid review, as a Councillor. I am now chair of the heritage portfolio and we are undertaking more heritage work than has been undertaken in a generation. I am totally invested in seeing these reviews completed and embedded in the planning scheme. These studies will likely include things such as interiors, street objects and public art that haven’t been protected before. Do you agree that these are also worthy of protection? YES if the report recommends so. Many such items are now highly recognisable as part of this city. I think anything that helps preserve buildings, whether interior or exterior, that is important to the history of our city and allows us to educate the younger generation would have my full support. With regards to street objects and public art I believe it would need to be on a case by case basis. If it is in line with the history of the city and can be used as an education as well as a visual blessing, I would also support that. In favour of protection of public art and objects that are in the appropriate locations that are not in-congruent with Melbourne heritage buildings. protection and I look forward to reviewing what the studies commissioned by Melbourne City Council recommend in that regard. I agree that these are worthy of protection. I included “Vault” in the Southbank planning scheme amendment, and though interiors are difficult to protect through local heritage overlays and statements of significance, we should definitely be doing so. We need to broaden the scope of what we consider to be Heritage beyond colonial buildings, any moves to include public space, street objects and public art is certainly a step in the right direction. Heritage guidelines for the City of Melbourne have recently been reviewed, and will likely result in stricter controls on development to ensure heritage is protected beyond more than sheer facadism. Would you support such changes? YES. Need new rules as city’s development is more matured now. Victoria is a leader in the conservation and management of heritage and I believe this has contributed to us being voted the worlds most liveable city 7 years in a row. We are rich in culture and history and this needs to be protected as much as we can. Perhaps if more developments adopted the façade of the original buildings they may see the beauty that we all do. all know that the heritage fabric often exists beyond the façade though a balance needs to be struck between development and heritage protections. In recent times the pendulums has swung too far away from protecting our precious heritage. I support these changes and have worked closely on amendment C258 to ensure that three-dimensional forms of buildings, regardless of the grading level, are respected and incorporated into any redevelopment. Yes, heritage is about making sure that cultural space is protected beyond a façade. In recent years, some historic buildings that have missed out on formal protection have been demolished, for instance the 1880s carriage Workshop at 40 La Trobe Street. In that case, despite an Officer’s report recommending interim protection, a majority of Councillors refused, not wanting to ‘change the rules midway’. What is your view on protecting individual places, missed by outdated CoM heritage studies decades ago, when they come under threat? Interim Protection is supported but require these new rules to be implemented quickly. Otherwise, VCAT will overrule Council. As mentioned earlier it is something that would definitely need to be a priority and I am a firm believer in hearing all sides of every story before making a decision. I believe when anything comes under threat, whether there are rules underway or not, it deserves to be spoken about and discussed. I would take a strong stance for protection. OUTDATED STUDIES OR LAWS. IT IS THE COUNCIL’S RESPONSIBILITY TO MAKE SURE THEY ARE UP TO DATE. IN ANY CASE, A HERITAGE BUILDING UNDER THREAT MUST ALWAYS BE GIVEN DUE ATTENTION AND PROTECTION, INCLUDING LAST MINUTE IF NECESSARY. investigation. I also commit to broadening and deepening studies of our city to ensure that instances like this do not occur. 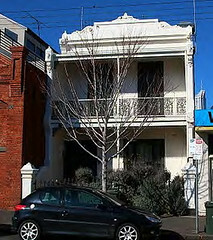 The Greens were not part of the majority of Councillors that refused to seek a heritage overlay for 40 La Trobe St. As heritage buildings outside the heritage overlay come under threat, Council and the Planning Minister should cooperate to ensure that community expectations on heritage retention are met. The catalyst for my review of the Hoddle Grid –which contains many heritage buildings without statutory protection – was the obvious inefficiency of a site-by- site application of heritage overlays after applications are lodged; given the relative powers of the Planning Minister over Council’s intentions, site-by- site interim overlay requests are unfortunately not guaranteed to succeed in retaining heritage fabric. I would need to look at individual cases to make an informed judgement but I believe there is a need to relook at how we define heritage. If you do not agree with listing ‘at the last minute’, would you actively lobby developers to retain heritage where a place isn’t protected ? encouraged to come to the table to retain more of the heritage aspects. I have built my reputation on standing up for those that cannot speak up for themselves. I believe the history of our town is important and I believe I would have no problem lobbying if I was required to do so to protect something that has contributed to our history. I BELIEVE THE COUNCIL MUST TAKE LEADERSHIP ON THIS ISSUE AND NOT LEAVE IT UP TO DEVELOPERS. whilst also providing certainty for property owners. Above and beyond my previous response, yes: Council should lobby developers to retain heritage and, moreso, demonstrate the economic benefits to the developer to doing so. Broadly yes but each case needs specific attention and detail and I don’t want to generalise. Recent cases of heritage loss such as the Palace Theatre interiors and Duke of Kent Hotel have shown that community exceptions around socially significant buildings are not properly reflected in current heritage guidelines and listings. Do you agree that the value of heritage places can be as much about their social history as it is about architectural intactness, and will you support the protection of such places that might otherwise be overlooked ? Yes the social aspect is important as seen in the Victoria University application in Little Lonsdale Street where the first VD clinic was protected. The building itself was quite derelict. Interiors where possible should be protected but the Heritage guidelines need to be strengthened as they are not clear enough currently. Absolutely. I believe if there is a solution we can come to a compromise to preserve buildings that may hve been overlooked, it is worth the discussion. planning professionals to produce a set of planning outcomes that deal with socially significant sites while also ensuring the city can continue to grow and change. I strongly agree. I am disappointed that the Palace Theatre statement of significance was watered down by Council on the basis that social history was less important than the pure architectural integrity of the building. The chaotic mess of decorations from different periods in the interior of the Palace added to the community’s love of the place; properly recognising social history is essential in modern heritage conservation practices. Absolutely, heritage is more than buildings, it is about history as well as the social role of a building within the city and yes I want broaden the protection of overlooked areas. Major changes are planned to be undertaken at and around the Queen Victoria Market by Council. These include a large basement service and carpark under some of the sheds, working with developers on creating new buildings at two sites, including two high rise towers, turning the carpark into a plaza, and changing the market mix. MHA is concerned about the loss of heritage buildings around the market, the visual impact of tall buildings, and whether the market itself will become more a place for tourists, and less a place for fresh food. We also think that the basement proposal, which was rejected by Heritage Victoria, was unnecessary and services can be provided with less disturbance. What is your view about the current renewal plans ? I have previously supported the Munro redevelopment to provide for the Car parking, Community Centre and the Child Care Centre for the City. In the original, I supported more car parks under the Munro site and do upgrades to facilities for the market traders including weather protection, lighting and heating as well as better facilities for Disabled Toilets called Changing Places. There is an issue with the storage facilities and the constant movement of goods around by the traders which is both an Occupational Health and Safety issue and public safety issue. Since the recent Heritage Victoria decision, I believe a plan B should be considered where storage facilities, extra car parks, the public event space as well as street level improvements can be accommodated in a different manner and we need to go back to the stakeholders for this Plan B. If necessary, a Task Force involving Council, Heritage Victoria, market trader representatives and QVM Management be set up to look at this project and then propose a Plan B. We need to upgrade the market but to do it properly and respect the history and minimise disruption. To be perfectly honest I am not a huge fan of high rise towers. Turning the carpark into a plaza would take away the entire ambiance of the market. It would just become yet another mall and I think we have enough of those already. The Queen Victoria Market is one of my favourite places to go on a Sunday and I would be quite devastated if it was changed to almost zero recognition and lost the beauty of the original feel. See above; I do not favour these re-development plans and in favour of restoration. Like Paris, should be able to have thriving community market with lots of atmosphere that is also interesting to tourists, that supports prosperity as much as possible for all of the community. More than 10 million people a year visit this beloved institution. The Robert Doyle ‘renewal’ project to develop the market will completely destroy its character. The proposal to develop the market is a reflection of the culture at Town Hall that needs to change: a culture where some councillors, including the Greens, voted for a project they didn’t believe in; a culture where community views on this divisive proposal were not properly considered; a culture of entitlement, intimidation and secrecy. There are only two candidates who are advocating for a complete review of the proposed development. Vote 1 Sally Warhaft if you want to save the Queen Victoria Market from becoming like a shopping mall. Vote 1 Sally Warhaft if you want a truly independent, female Lord Mayor who will work with the other elected councillors to reflect the diversity of views of the people of Melbourne. If you don’t want to vote for Sally Warhaft then vote 1 for Gary Morgan instead. He is the only other candidate whose priority at this election is to save the Queen Victoria Market from disastrous development. A lot has been said about the Queen Victoria Market so far during this campaign. Unlike other candidates, I’m taking the time to listen to all stakeholders. The first challenge of good representation is properly understanding the problem. I’ll be announcing my plan to get the Queen Victoria Market back on track shortly. I have supported aspects of the renewal (primarily the new large park to replace the existing carpark), and opposed others. My own motion to Council stopped the conversion of H and I sheds to a dining hall and ensured its use as a fresh fruit and vegetable sales area. My motions also ensured no construction in the vicinity of the aboriginal cemetery, and caused the halving of the impact on A-D sheds of proposed underground development. With Heritage Victoria’s refusal of a permit to refurbish A-D sheds, Council has an obvious opportunity to explore alternative options to improving trader utilities and services, and should sit down with Heritage Victoria, traders and the community and demonstrate good faith by exploring such options transparently. I don’t support a crash-through appeal to the Heritage Council. The bottom line for the market is ensuring that it is able to trade sustainably as an affordable fresh food market for generations to come. There needs to be some change to the way Vic Market runs. As the original plans have been rejected, it needs a relook with proper consultation with those involved. My feeling is the greatest problem with the original plan was how it was communicated. I do want to ensure that the Market’s cultural heritage is maintained and it remains a central living, breathing fresh market for locals and tourists alike. The previous Planning Minister Mathew Guy described some modernist buildings such as the Hoyts Cinema Centre tower as ‘ugly’, and delayed protection for seven post war modernist places recommended in the 2012 C186 amendment. What is your view on the heritage value of significant modernist architecture? Not being an expert on this topic, I prefer to let the experts fight this out. My view is not all old buildings mean heritage and not all modern building should not be classed non- heritage. It is about its significance in the historical period of our city. The next such building will be Festival Hall. Ugly? Possibly but significant to our city’s music cultural history? Yes. I am favour of protecting buildings like Hoyts Cinema Centre Tower. ARE REFLECTED IN ALL THE DECADES OF MELBOURNE’S BEAUTIFUL AND SIGNIFICANT BUILDINGS. THEY TELL A STORY ABOUT WHO WE ARE. Mr Guy’s intervention was inappropriate, and I was highly critical of it at the time. When Mr Wynne took over as Planning Minister, I moved a motion to request him to apply protection to the buildings that Mr Guy omitted. Mr Wynne did so. Significant modernist architecture is worthy of protection. Modernist architecture is important and should be protected. The City North Heritage Review also gave protection to a post-modern apartment building built in the 1990s. Do you believe that outstanding Postmodern architecture of the 1980s and 1990s is worthy of protection? Will depend on each case but if such a building was recognised in special mention at that time, then it probably should be considered for protection. I cannot honestly say that I enjoy the view of modern architecture as much as I love the older buildings, however in saying that; protecting a building is not about whether or not it is “pretty”, it is the relevance to the history of the town. Nothing frustrates me more than society’s’ obsession with making everything “insta-perfect” looking at the expense of history and culture. Our perspective is often informed by time, but we will rely on the experts. I supported the inclusion of Melbourne Terrace Apartments in the heritage overlay as part of the City North heritage review. Outstanding postmodern architecture is worthy of protection. I would include Federation Square in this category! Some, I would have to look at it on a case by case basis. Many of Melbourne’s famous bars and cafes, creative industries, start-ups, NGO’s, and art spaces that make the CBD such a unique place, occupy cheaper spaces in the many smaller heritage buildings, and some larger ones such as the historic Nicholas Building, described as a ‘vertical lane’. Such places are facing increasing rent pressure, threatening the vitality of these occupants remaining in the central city. Do you think Council should investigate mechanisms to protect such low rent spaces ? Being privately owned, the only realistic action by Council is the provision of grants to help with the rental. Council does this already with its owned buildings like City Village at 225 Bourke Street. If Council owned more buildings, it could expand this type of assistance but it does not from my knowledge other than 602 Little Bourke Street. Of Course, Council can lobby the State Government for more funding to support the start-up creative industries but that would not be easy. Yes I do. Part of the appeal that Melbourne has is these funky little places that you can search for and find when you visit the city. Getting rid of them to make money and turn them into just another city will take away some of the appeal out city has to tourists. RENT SPACE IN THE CITY OF MELBOURNE. land tax costs particularly as they attach to strata title buildings in order to keep rents down. Council does not have the ability to regulate private rents, but it does have the ability to seek heritage protection, promote certain spaces, and use our innovative Creative Spaces program to continue to broker continued creative uses in heritage and vacant buildings. Yes, council should be supporting local industries including art and design and using historic buildings is a great way to do this. One of those places is the Degraves Street underpass / Campbell Arcade, currently occupied by a range of creative spaces. What is your position on the current plans that would see the destruction of nearly half the shops spaces by the Metro Tunnel works ? Will you lobby the State Government on this issue to ensure a solution that doesn’t displace important arts communities and diminish the heritage fabric? Of course, we should lobby the State Government but from experience, it often fall on deaf ears. I do believe that in this situation, Council, through its Lord Mayor must not be afraid to take on the State Government and fight for the important things of this City and this is one of those very important things. This is a tough one as we definitely need to do something about the Metro tunnel however should we do something that diminishes our fabric? I believe there could have been a better solution had people actually put the time and effort into finding a happy medium as opposed to looking after one specific group of people. I am all for compromising to find happy solutions for the greater good. Some things take a little more time and require some lateral thinking but I believe it can be done. Absolutely……Infrastructure development should be complementary to community. minimise damage and disruption the will arise from this project. Yes, and I have done so already. The impacts on Campbell Arcade were not included in the draft planning scheme amendments released before Christmas, and the issue has only come to light more recently given the intention of the Cross Yarra Partnership to locate the Flinders St underpass here, rather than further east as originally planned. Campbell Arcade is an important heritage space, on the Victorian Heritage Register no less, and as Lord Mayor I will lobby for its retention and for a solution to the Town Hall Station / Flinders Street Station crossover that minimises heritage impacts. I am passionate about protecting Campbell Arcade and if elected will lobby State Government to make sure that the local artistic communities of Campbell Arcade are protected. The 2012 Heritage Strategy recommend looking at ways of increasing the impact of the Melbourne Heritage Restoration Fund, but nothing has eventuated. Ideas such as simply adding more money to the fund or providing rate relief in return for owners repairing and restoring buildings have not been considered. Do you think that more should be done to provide monetary incentive to owners of heritage buildings? I have always believed that the owner of a Heritage Property must be responsible for its maintenance to prevent it going into disrepair. If they neglect their responsibilities, and then ask Council or the Heritage Restoration Fund to help “fix” problems, I do not support that when governments owns Heritage Buildings, Governments have to spend money to keep these buildings in good condition, eg Melbourne Town Hall or Kensington Town Hall. However, in some cases, there may be valid reasons for some buildings falling into disrepair. Hence the existence of the HRF. One way to increase the capacity of the fund is the application of a levy in developments within a Heritage Overlay area. This levy is then used for works to maintain heritage aspects within that overlay including public art and street objects. There are a lot of things in former strategies that have not eventuated. I believe it is about time that someone should be held accountable to the things that are promised and never eventuate. It is for the sake of our city after all. When it comes to problem solving to find ways to make things work, this is an area of strength and I will certainly use my skills to do the best I can for the City of Melbourne. need to consider providing funds. Providing funds to property owners, if it is appropriately targeted, can be an effective mechanism to achieve positive heritage outcomes. Yes. The Annual Plan action I included in the 2017-18 Annual Plan and Budget, “Progress work on incentives to property owners for ongoing heritage preservation,” is due to be reported on shortly. ← Carlton Inn reconstruction – Have your say !